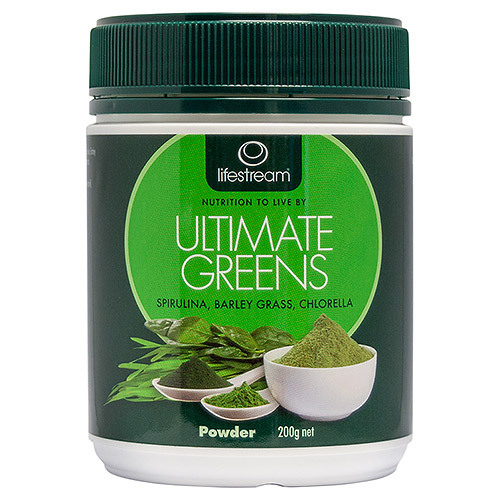 Lifestream Ultimate Greens is a highly effective blend of the green superfoods; Lifestream certified organic spirulina, Lifestream chlorella and Lifestream certified organic barley grass. Ultimate Greens helps to fill in any nutritional shortfalls. These are nature’s highly concentrated nutrient-rich ‘green’ foods and they provide micronutrients that are often lacking in processed foods but are a necessary part of our diet. Lifestream Ultimate Greens surpass synthetic multi-vitamin formulas because they contain compounds that cannot be recreated in a laboratory. The natural phytonutrients in Lifestream Ultimate Greens are in a ‘bioavailable whole-food’ form. Equal parts of: certified organic spirulina, certified organic NZ barley grass and chlorella. Adults: 1 rounded teaspoon (3g) daily. Children 6-12 years: ½ teaspoon (1.5g) daily. Add to juice, yogurt or your favourite smoothie and mix well. Below are reviews of Lifestream Ultimate Greens - 200g Powder by bodykind customers. If you have tried this product we'd love to hear what you think so please leave a review.